I have walked by 'wichcraft in NYC many times and thought I might stop by someday when I was hungry for a sandwich. Little did I know one of their tastiest offerings are their cookies! They had them at the media event yesterday and I was hooked! The peanut butter cream'wich are my favorite. Tina and I risked drowning and a potential lightning strike in Bryant Park during a torrential downpour in order to get some of these cookies to take home. I meant to take a picture of them, but alas, all that is left are the wrappers! 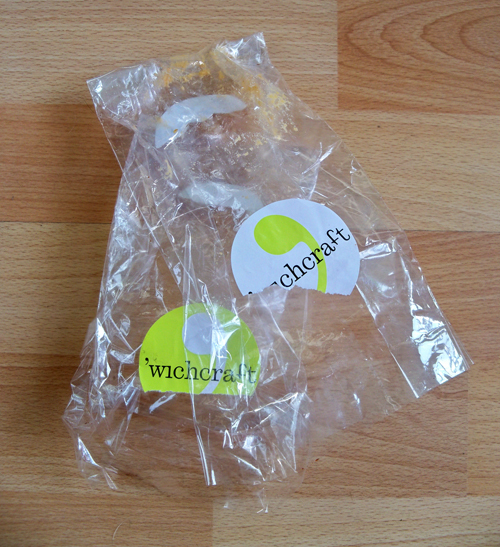 You KNOW they're good when you never even get a chance to take a pic and all that is left is the wrapper. Sign of excellence. Gotta try these next time I am there.